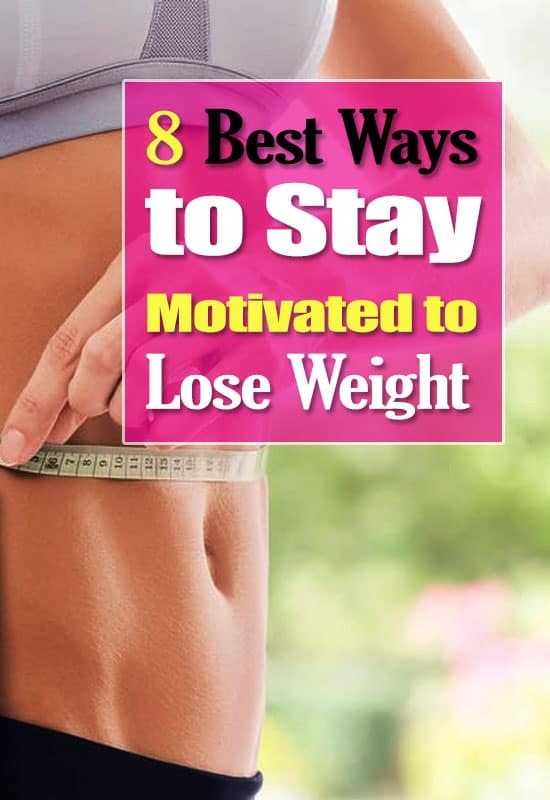 8 Best Ways to Stay Motivated to Lose Weight: Don't Miss This! 8 Best Ways to Stay Motivated to Lose Weight: Don’t Miss This! Home » Weight Loss » 8 Best Ways to Stay Motivated to Lose Weight: Don’t Miss This! It is very easy to think about losing weight, however, it’s difficult to stay motivated. If you want a positive result, you require some inspirational tips to sustain your consistency for a long time, and I have them! Dear viewers, today I will give you some of the best ways to stay motivated to lose weight during your weight-loss program. Read More: Bikram Yoga Weight Loss Method: Read How Hot Yoga Weight Loss Workout Works? Are you Planning to lose 20 pounds in a month? Listen, you will try this way if you want to be a big loser. This is not a realistic way. In fact, Impractical goals will push you to be a failure; you will not be able to stay motivated yourself when it doesn’t work. We might all know that some of the exercises or diet plans promise to give a super speedy result. Will it be very good for your weight loss program? Absolutely Not!” Realistic Weight loss plan takes some time and efforts like is a marathon, not like a 100 meters’ sprint, therefore get real! Collecting photos of your progression is an outstanding way to stay motivated on your weight loss journey. It will keep your feelings high! Many studies have shown that taking photos can keep dieters to stay motivated, it will reach you in a targeting weight. When you stand in front of a mirror to look at your body’s improvement, it seems to be hard to find out a difference. But taking a snap proof before and after cases in your weight-loss program helps to make difference. For more inspiration, post photos on your social media platform. If you don’t like running on the treadmill, possibilities are, you will not do it. If you feel it like torture, it will be difficult to stay motivated! But you have good news, Exercise gets in so many ways; you simply require finding somewhat you like to do! Look into Zumba videos or online classes. Try to spend your time with some buddy for walking and talking. Aren’t you confirm to start from where? Collect a class timetable from the local gymnasium and see if any of the possibilities pique your attention. Try to find a trial that you really thought about. It might sound a strange tip for motivation, but it works very well. But Why? When you feel sleepy, your thinking ability gets fades and your emotions manage the capture. Really, sleep is one of the remarkable reason you aren’t losing weight! At least 8 hours of sound sleep is very much required to stay motivated to lose weight. Read More: Juicing for Weight Loss: Is Your Juicer Brings the Ultimate Health Benefits to Your Weight Loss Plan? Try to Find a partner in your weight-loss journey. It will make a huge difference in your achievement. Having somebody to hold your responsibility is really motivating. You will have less possibility to miss the workout session if you know your friend is with you, am I right? But, if you don’t have somebody to share, you can get support from the online, utilize social media. There are numerous motivating weight-loss groups on Facebook. You can join there. Who doesn’t want to stay motivated by the promise of reward? Pick something that is connected to your weight-loss achievement. Drop your waist size? Purchase some new jeans within your capacity! Muscles sore? Because you have practiced hard. That means you have got yourself a massage. There are some apps and group contests that promise to give rewards for weight-loss success. Try to spend your money in the right place and at the right moment. Yes, the scale is the real method to observe your weight loss journey, but, we put excess weight into the figures. Many issues affect your weight, like how much water you drunk that day and how much sodium you took the day before. If you stand on the weigh scale daily, you may lose inspiration. I suggest choosing one time weekly to weigh yourself. Wear the same dresses when you weighed in. Throw away all-or-nothing attitude. It will be shocking to get inspiration. When goals become hard to achieve, we surrender. One certain mistake, you’ll want to skip your weight loss journey. Don’t do that. Be kind to yourself. After all, you are a human being! Postpones are normal. But You don’t need to give up all of your preferred foods during your diet control; that is a complete weight-loss myth. What is your opinion after reading the article about 8 Best Ways to Stay Motivated to Lose Weight?